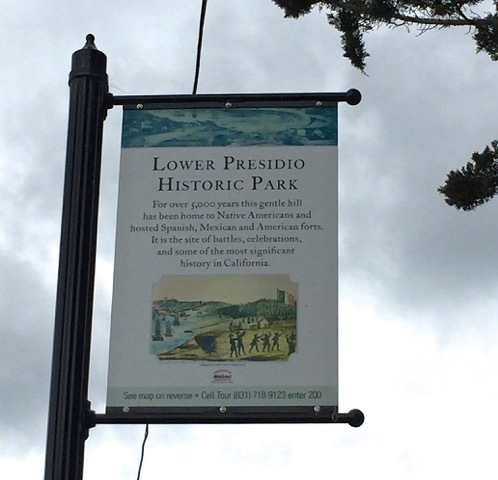 The Old Monterey Foundation is pleased to report that Monterey’s Neighborhood Improvement Committee (NIP) has allocated $215,000 to our request for funding of the preliminary implementation of the Master Plan for the lower Presidio Historic Park. It was nip and tuck as the voting to allocate about $3.8 million went to a third round, where we garnered 51 votes, sufficient to win funding from the remaining $750,000. There were many worthwhile projects nominated for funding this year, and most of the funding went to traditional neighborhood improvements like sidewalks, drainage, and landscaping in the first two rounds. In the face of this competition, OMF reduced our request from a total of $752,000 to $215,000, which was the minimum needed to begin the transformation of the Lower Presidio from an overgrown waste area to a real public park. With these funds, we expect to accomplish the signage necessary to inform and direct the public to Park, including entrance signs at both entrances to the Park and several off-site signs pointing the way; construction of a concrete walking path from the existing parking lot out and around the promontory of the Serra Monument and sites of El Castillo; handicap access; benches overlooking the harbor; and some interpretive signs. Not included in this round of funding is the removal of trees blocking the historic view of the Harbor ($47,000); replacement of the cyclone fence with a historically accurate wooden slat fence around the entire perimeter of the Park ($100,000); and the pathway up to the Sloat Monument ($245,000). The NIP allocation goes before the Planning Commission and the City Council for final approval (in June). While we are waiting for that assured approval, OMF is getting the administrative effort organized between the City and State authorities, and the Federal authorities. Hopefully, we will all be ready to leap forward in June after final approval. It is not unreasonable to hope and expect that the majority of this implementation piece will be underway before the end of the year. While that effort is ongoing, OMF intends to fund and begin a public awareness program to inform the public of these developments and set the stage for funding of later developments in the Park. The Army’s Manager of the Presidio environmental and cultural programs has agreed to start what may be a two-year program to develop archaeological protocols with the affected indigenous Americans for digging and excavation on the site, which will be required by later phases of the Master Plan. Once those protocols are in place, progress in developing the Park will be unfettered by bureaucratic delays. In the immediate future, OMF will be writing grant applications and soliciting private funding for completion of the Phase I implementation – including removal of trees, erection of a wooden fence, and constriction of a pathway to the Sloat Monument.